I’m running behind on posting my update, but I did do my weekly weigh on Saturday as usual. The results were a disappointing 1 pound loss, meaning my weight for the week was 341 pounds. I had figured for sure that I’d be at least 340 or less since I actually did the 5:2 Diet stuff properly last week. I’m not exactly sure where I may have gone wrong, but I do know that I was eating larger breakfast meals, likely too large calorie wise. I’ve already begun to correct that this week, making sure to only have a smaller meal before heading out the door. 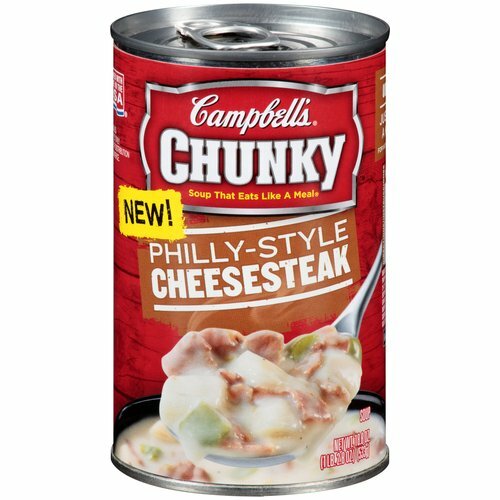 On the lower-calorie food trials, I decided to take a chance on a new Campbell’s Chunky Soup product, this time the Philly-Style Cheesesteak soup. Clocking in at 300 calories a can (150 calories per serving), the soup is very creamy with bits of steak and potato. I laughed at the recommended “pour over a Kaiser roll” method for serving this product. I wouldn’t do this for any other soup, and I wasn’t going to do this for this one, the use of “cheesesteak” notwithstanding. Not too bad. It does taste somewhat of cheese steak, but having potato in it throws things off. If you are craving a cheese steak sandwich, this won’t hit that craving. It will hit a craving for a creamy soup with steak and potatoes. Here’s hoping for a better week come Saturday. This entry was posted in Weight Loss and tagged 5:2 Diet on September 9, 2013 by AstroNerdBoy.